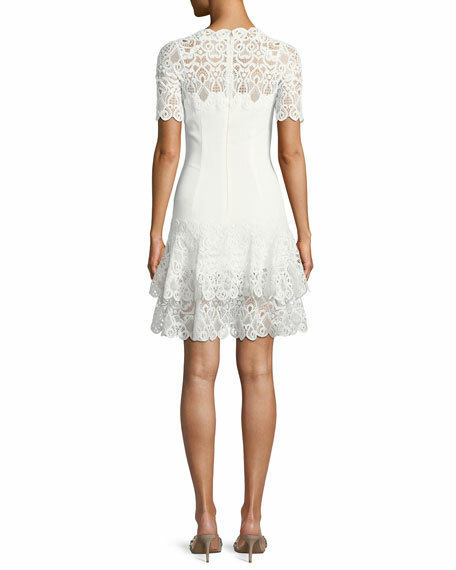 Jonathan Simkhai dress with lace appliqué. Jewel neckline with illusion strapless yoke. Aidan by Aidan Mattox crepe and lace mini cocktail dress. Approx. 24.8"L down center back. V neckline and back. Sleeveless. Aidan by Aidan Mattox crepe and lace mini cocktail dress. Approx. 24.8"L down center back. V neckline and back. Sleeveless. A-line silhouette. Hidden back zip. Mini length. Polyester/nylon/spandex. Lining: polyester/spandex. Dry clean. Imported. Model's measurements: Height 5'10"/177cm, bust 33"/84cm, waist 25.6"/65.2cm, hips 35.8"/91cm, dress size US 2-4/FR 34-36. Donna Mizani "Norah" dress with asymmetric bodice. Approx. 25.5"L down center back. Off-the-shoulder neckline. Asymmetric short sleeves. Wide, banded bodice. Donna Mizani "Norah" dress with asymmetric bodice. Approx. 25.5"L down center back. Off-the-shoulder neckline. Asymmetric short sleeves. Wide, banded bodice. A-line silhouette. Hidden zip closure. Mid-thigh length. Polyester. Dry clean. Imported. Model's measurements: Height 5'10"/177cm, bust 33"/84cm, waist 25.6"/65.2cm, hips 35.8"/91cm, dress size US 2-4/FR 34-36. 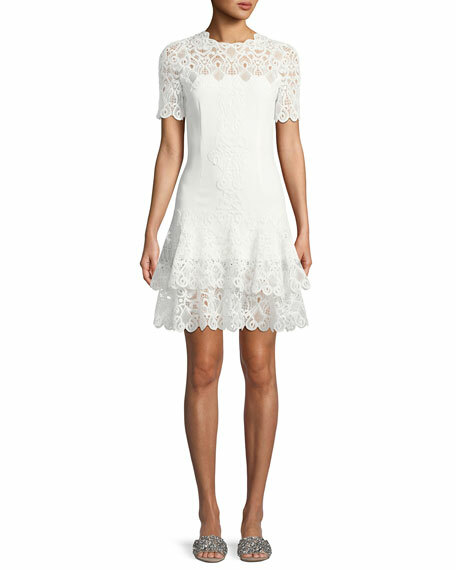 Halston Heritage flouncy cold-shoulder dress. Halter neckline. Ruffle short sleeves. Cold-shoulder cutouts. A-line silhouette. Hidden back zip. Mid-thigh length. Asymmetric ruffle skirt. Polyester self/lining. Dry clean. Imported. Model's measurements: Height 5'10"/177cm, bust 33"/84cm, waist 25.6"/65.2cm, hips 35.8"/91cm, dress size US 2-4/FR 34-36.